Once again, for my graduate program I have to do a “phenology project” of some sort over the course of the semester – regular readers will remember last fall’s. This time around, rather than returning to the same spot I was following before, I’m going to try to document the coming of spring to Pickerel Creek, which flows through the property where I’m working this semester. Currently we’re experiencing a depressing thaw, causing what was a lovely snow base to turn disgustingly slushy. Still, as we went through the photos this afternoon from the trail cams we’d posted along Pickerel Creek, this gem cheered us up. That’s a mink in the lower left. Pretty cool. Expect to see more of Pickerel Creek over the next few months. My goal is to do some sort of phenology post roughly once every two weeks. Update: For anyone interested, a small debate about whether this is actually a mink or some other mustelid has sprung up here on Facebook. Cool shot….moved getting a trailcam a couple of notches up on my priority list :). If you’re taking a poll, I’d be inclined to say we’re looking at an otter here. mostly because of the thickness of the tail. If I were in the area, I’d look for evidence of the “slides” that otters are so fond of making in the snow. 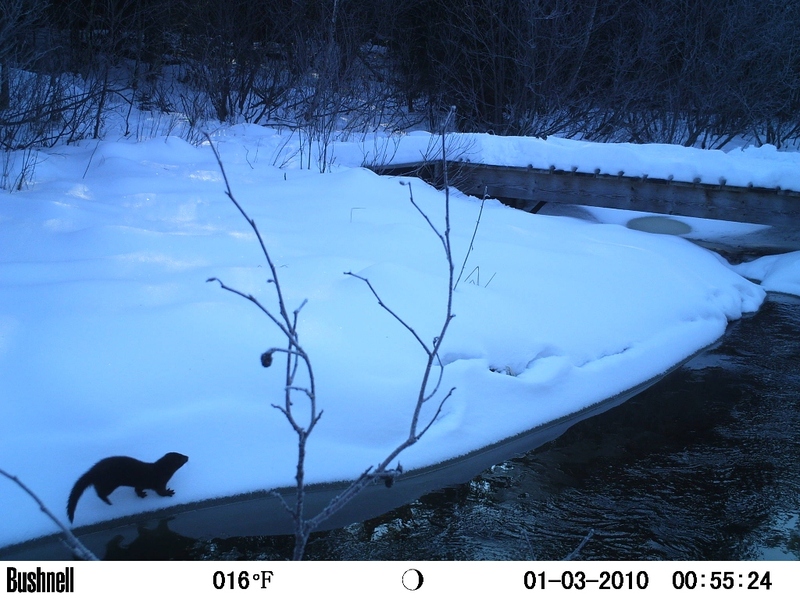 That’s what the other graduate assistant and I thought at first, but our boss convinced us it’s a mink, due to its more pointed snout and its size (hard to judge from just the photo, but we had the advantage of knowing just how far the camera actually was from the creek edge). I don’t really know for sure.